Smartphones, those digital portals of constant information, have become so integrated into most Americans’ lives, they’re like extra—yet essential—appendages. Some 72 percent of Americans own a smartphone, compared to the global median of 43 percent. But studies have shown that overuse can have a negative impact on your posture, eyesight, and hearing, not to mention distract drivers and pedestrians. 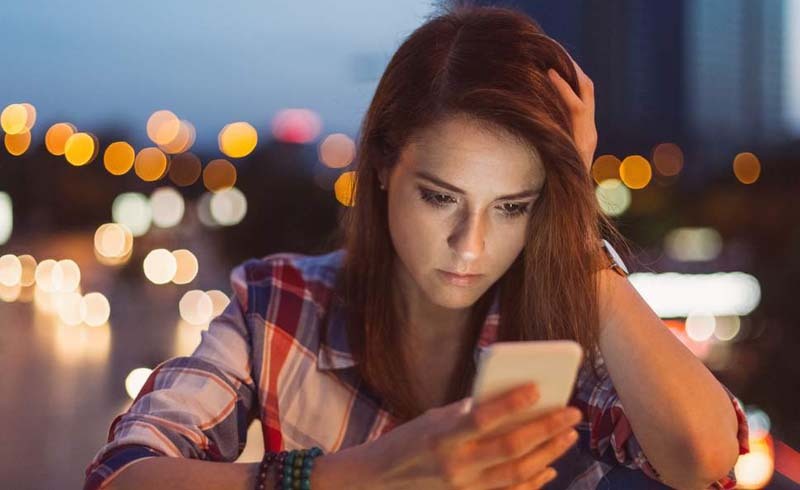 More recently, researchers who study the relationship of mobile phone use and mental health have also found that excessive or “maladaptive” use of our phones may be leading to greater incidences of depression and anxiety in users. It is, however, tricky to parse out whether or not excessive phone use causes these symptoms, or rather if it just exacerbates existing depression and anxiety. Mental Floss took a look at the findings from some recent studies on the subject and asked a clinical psychologist to weigh in. A 2016 study in Computers in Human Behavior, titled "Fear of Missing out, need for touch, anxiety and depression are related to problematic smartphone use," set out to explore previously reported causality between “problematic smartphone use and severity of depression and anxiety symptoms.” A total of 308 university students—165 men and 143 women—answered a questionnaire that assessed their mental health, their cell phone and Internet usage, and the reasons they used them. Cell phones, and smartphones in particular, have an undeniably addictive quality, earning an entry in the Diagnostic and Statistical Manual of Mental Disorders (DSM) 5th edition. A review of literature on cell phone addiction, published in Frontiers in Psychiatry, describes cell phone and technology addiction manifesting in one or more of the following ways: choosing to use your device even in "dangerous or prohibited contexts;" losing interest in other activities; feeling irritable or uneasy if separated from your phone; or feeling anxiety or loneliness when you’re unable to send or receive an immediate message. The researchers also find that adolescents and women may be more susceptible to this behavioral addiction. This negative feedback loop of addiction may pose problems for people who already have trouble regulating negative emotions or tend to suppress them; they may turn to the phone as a coping mechanism. Initially, this may help as a distraction, but over time, it creates a pattern that has negative impact on mental health. In a 2015 study, also published in Computers in Human Behavior, that examined 318 graduate students at the University of Illinois, researchers found that people who already experience depression and anxiety often turn to their phones or other “information and communication technologies” (ICTs) as a tool for avoidance coping—temporarily distracting themselves from negative feelings. Over a long period of time, this can make a person more vulnerable to mental health problems. But if you’re thinking of how often you check Twitter to make it through a morning commute, don’t panic: Using the phone or other technology is only maladaptive over the long run “when users are attempting to escape negative feelings, thoughts, or experiences and thereby recruit the ICTs as a kind of therapeutic tool,” they clarify. Joel Minden, a clinical psychologist with the Chico Center for Cognitive Behavior Therapy in California, specializes in anxiety and depression. He tells Mental Floss that in his opinion, the research isn’t conclusive yet on whether cell phone or technology use actually causes depression, but he does agree that avoidance and escapism behaviors, including a social media fixation, can “take you away from addressing problem[s] head on.” He says he can envision a pattern of behavior where initial stress and anxiety might increase cell phone use, taking the person away from what he calls “anti-depressant activities,” such as socializing, exercising, and working. “Then the risk of negative feelings may increase,” Minden says. Researchers still haven’t comprehensively explored the different ways people are using their smartphones and other technology, and how these differences might contribute to their mental health. Minden feels it would be more relevant to distinguish “specific cell phone behaviors, not just global cell phone use.” For example, does it make a difference if someone uses their phone for social media or internet browsing, versus texting their friends? The 2015 Computers in Human Behavior study on avoidance did find that “lonely individuals” preferred voice calls over texting, while anxious participants preferred texting over voice calls—suggesting the method of use is connected to, and has an impact on, users’ mental health, both before and after they use their technology. Minden is more inclined to consider logical consequences of phone use, such as how cell phone usage at night might disrupt normal sleep habits, leading to fatigue, which can cause depression and anxiety symptoms. He cites one longitudinal study published in the journal Child Development, studying 1101 Australian high school students age 13 to 16, which found that poor sleep quality associated with late-night texting or calling was linked to a decline in mental health, including depression and low self-esteem. Minden was especially interested in the result that the students who used their cell phones frequently in the evenings were at greater risk for depression the following year. “What we can conclude from that study is that perhaps initially high levels of use in your early teen years may predict later depression,” he says. So while the research remains inconclusive, it might be worth taking a look at how you feel before and after you spend copious amounts of time on your cell phone. It may be harmless—or it may offer an opportunity to improve your mental health. U.S. Daily News: Is Your Mobile Phone Use Bad for Your Mental Health?